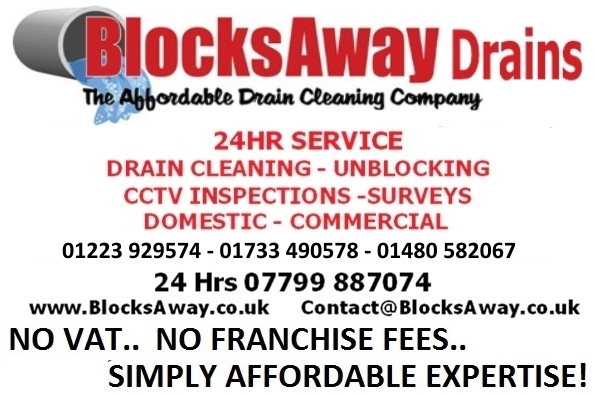 BlocksAway Ltd., member company of the Guild of Master Craftsmen, delivers a prompt, cost effective and efficient drain unblocking and blocked drain cleaning service as well as CCTV camera surveys of drains in Cambridge, Huntingdon, Peterborough and throughout Cambridgeshire. Our clientele includes private customers, public bodies, and commercial and industrial enterprises. We operate 24 hours a day, 7 days a week at our fixed charge of £89* throughout Cambridgeshire plus Newmarket and Royston. Thanks saw your post, I would pay towards being a member! !